It wouldn’t be a summer party without guacamole! This grilled guacamole calls for grilling avocados before mixing them with cherries for some sweetness and habanero peppers for some spice! Cherry season is here!! Hooray! I feel like this is especially exciting because, in this day and age, it seem like you can get so many fruits and vegetables year-round. But for fresh cherries, we really have to wait for summer (I also get super psyched when blood oranges, meyer lemons, and fresh figs are in season). And I think cherries are some of the happiest fruits around. When I was a kid, I was obsessed with Mary Engelbreit (please tell me I’m not the only one). Every year for Christmas, my mom gave me one of those page-a-day calendars and I’d rip out her fun little prints and sayings and hang them in my room. My all-time fave (and maybe the one she’s best known for?) said “Life is just a chair of bowlies.” I always thought that was hilarious and awesome and you know what? I kind of still do. It’s a great reminder that life should be fun… Not even in a bowl of cherries sort of way, but in a chair of bowlies way. You should get a little ridiculous and goofy because why not? That’s why I put cherries in my guacamole. My grilled guacamole. Because why not? I’m sure there are some guacamole purists who will be appalled, but I’m not really worried about y’all. Trust me, I love plain and simple guac with just a little bit of citrus, spice, and salt. 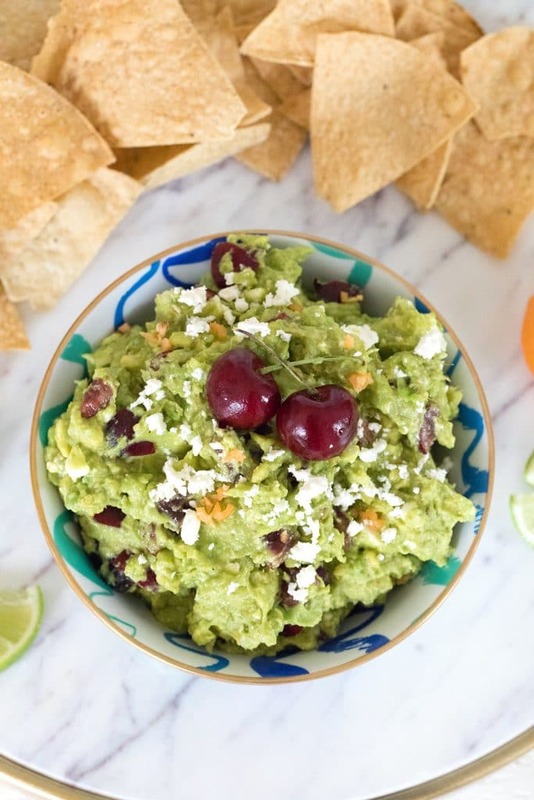 But it’s going to be a long summer filled with barbecues and entertaining and meals on the deck, which means there’s plenty of time for all kinds of guacamole. So, yes, I added cherries to this one, but also habanero peppers. Oh, and I grilled the avocados, too. 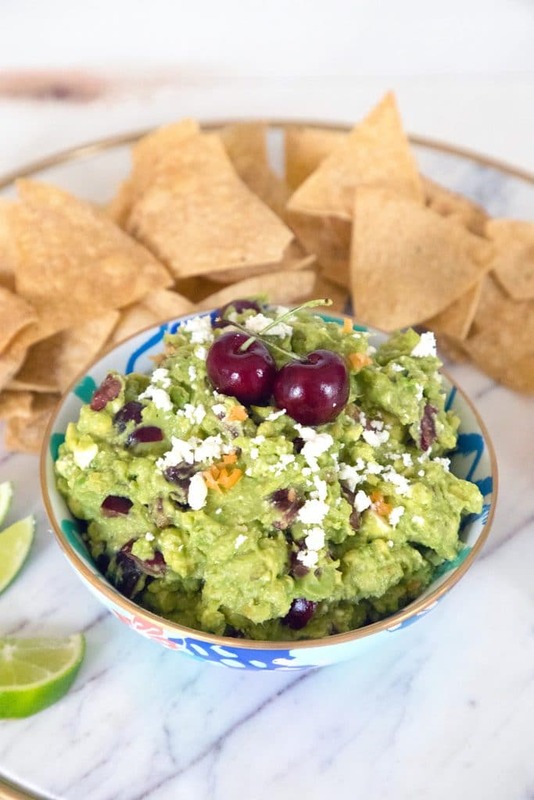 If you haven’t tried grilled guacamole yet, you’re lucky that the summer is just getting started, so you have plenty of time. 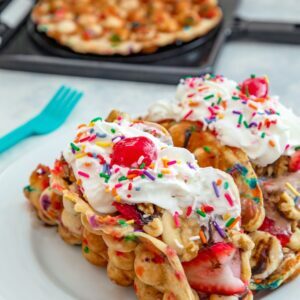 I took home some avocado oil spray from Chosen Foods when I was at the Everything Food Conference in Salt Lake City and figured this would be the perfect recipe to use it in. It has a super high smoke point (500 degrees), so I sprayed it on the avocados before grilling them. I used to not think twice about cooking sprays, but then I read about what’s in some of them, so I’ve been sticking to organic the last few years. Even those can be pretty bad, so I’m thrilled to have this alternative. 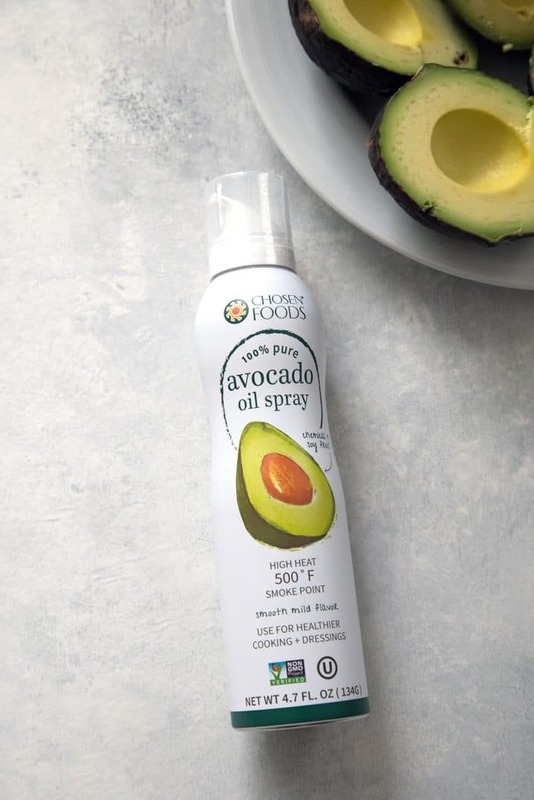 There are no chemicals or additives in the spray and it’s legit 100% avocado oil. I swear this post isn’t sponsored; I’m just a fan! Once I sprayed the avocados, I put them on the grill and waited for those beautiful grill marks to show up. And then I peeled them and mashed them up with cherries, habaneros, and some feta cheese. It also helps when you’re eating it with a ridiculously amazing chip. 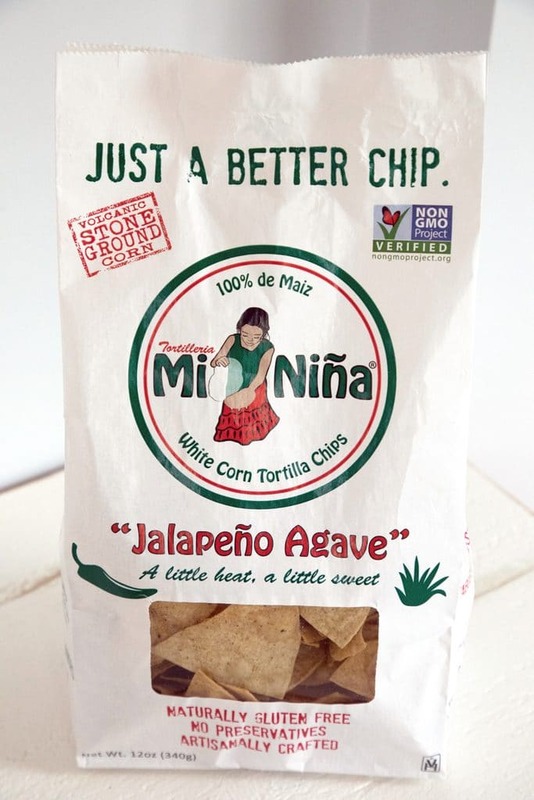 Even if you think you have a favorite tortilla chip, I promise you that if you try Tortilleria Mi Niña Jalapeño Agave chips, you will instantly change your mind. These are the best chips in THE WORLD. Sadly, they’re not currently available all over the world and mainly just in New England and some other spots on the East Coast. But they are pretty much my favorite chip ever and Chris totally agrees. And we’ve bought way too many bags of these over the past few weeks. Check out their “find us” landing page to see where you can get them! Anyway, they also didn’t sponsor this post, but clearly I’m very excited about the ingredients that went into this guacamole recipe. I think all guacamole needs a little spice, but that spice usually comes in the form of jalapeño peppers. I happen to love the flavor of habaneros and thought they’d add an even deeper spice, which would contrast perfectly with the cherries. And the combination definitely worked! The saltiness of the feta cheese didn’t hurt either. But, I mean, does feta cheese every hurt anything or anyone? I’m going with no. Oh wait, I didn’t even really talk about why grilled guacamole is better than non-grilled guacamole. OK so, the grilling gives the avocados a nice light smoky flavor. It’s not overpowering at all (I’m not a huge smoky flavor fan), but it makes the guacamole taste a little more summery. Everything about this grilled guacamole just feels like summer. 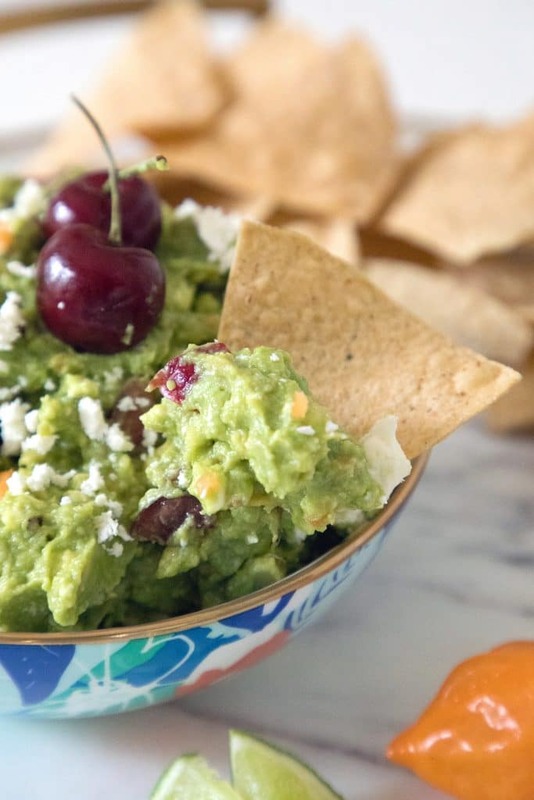 And since tomorrow is officially summer, I’m voting that you make it the summer of guacamole. Take traditional guacamole to a new level by adding in some innovative mix-ins… And finding the best chips ever to eat it with. Then again, a spoon works, too. What do you add into your guacamole? It wouldn't be a summer party without guacamole! 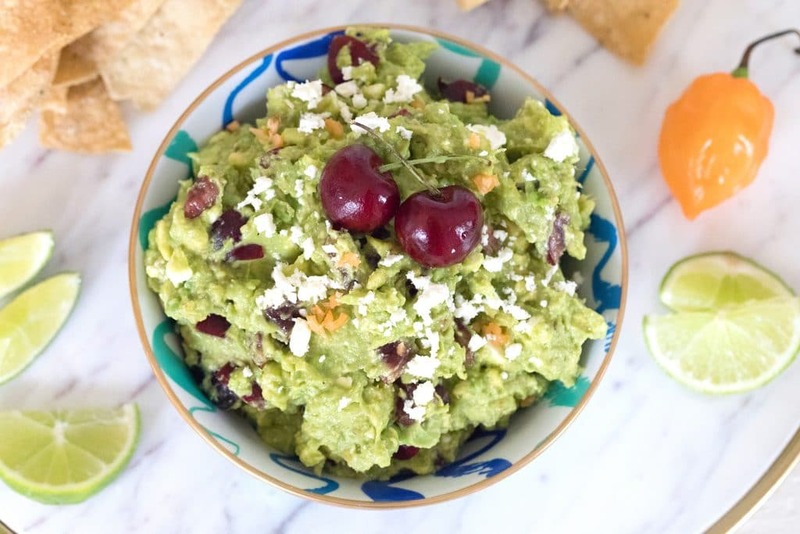 This grilled guacamole calls for grilling avocados before mixing them with cherries for some sweetness and habanero peppers for some spice! 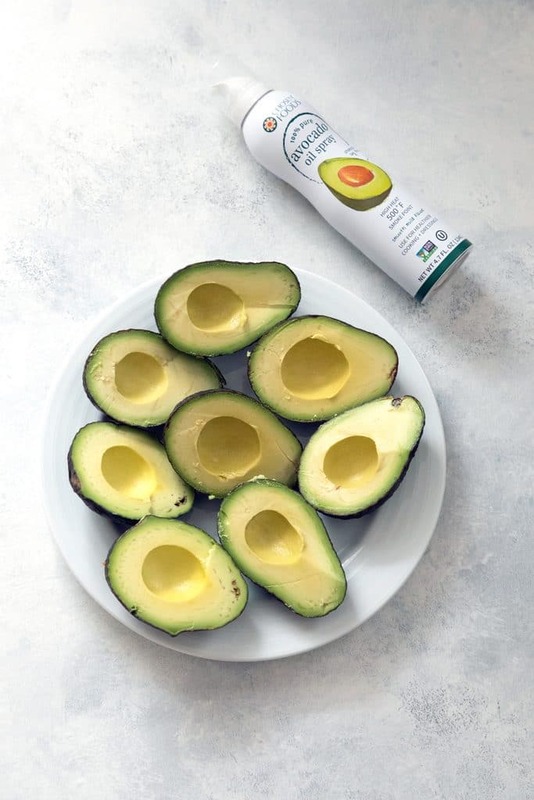 Spray or brush avocados with avocado oil or olive oil. 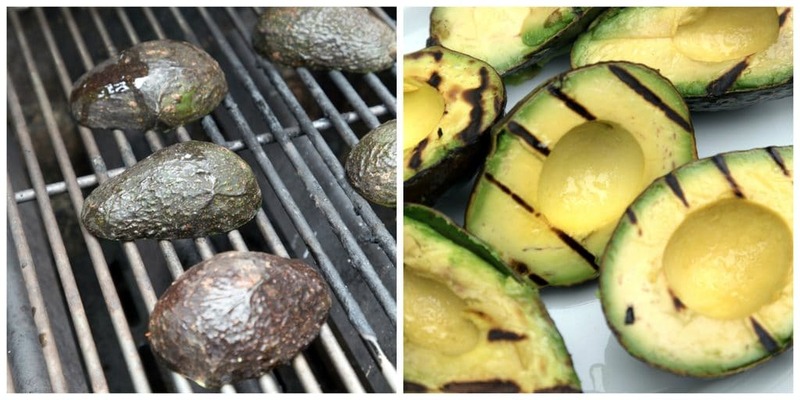 Place avocados on grill flesh-side down for about 3-4 minutes, until grill marks appear. Remove from grill with tongs and let cool. Peel and scoop flesh out and into a medium bowl. 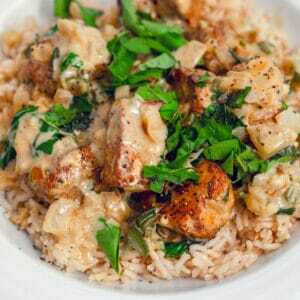 Add lime juice and gently mash avocado until it's at your desired consistency. Mix in chopped garlic, habanero, cherries, and feta cheese. 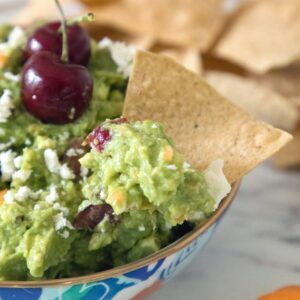 8 Responses to "Grilled Guacamole with Cherries and Habaneros"
I have to try grilling some avocadoes. They look so pretty and I’m sure add great flavour to your guacamole. I LOOOOOVED Mary Engelbreit as a kid. I had a mug with “the princess of quite a lot” on it and it was my favorite :). I was just thinking about her the other day because one of my neighbors has a flag outside that looks so Engelbreit-esque but I can’t imagine its an original. Can you still buy her stuff? Anyway. . .this is definitely one of the best twists on guac I’ve ever seen. I never would have thought to grill my avocados! YUM! The guacamole looks terrific. 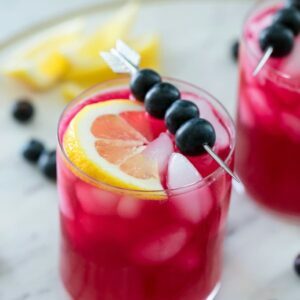 Never thought to add cherries. I first tried grilling avocado last summer and I fell in LOVE!!! Needless to say this grilled guac is calling my name! I seriously swooning over the addition of cherries and habanero!! I NEED this! 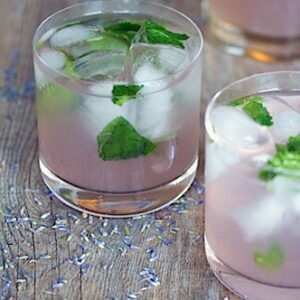 Cheers, girlie! Hooray for fresh cherries! It is funny how we do get a lot of fruit year round, but cherries are definitely one of those ‘wait for summer’ fruits. I’m LOVING this guacamole! 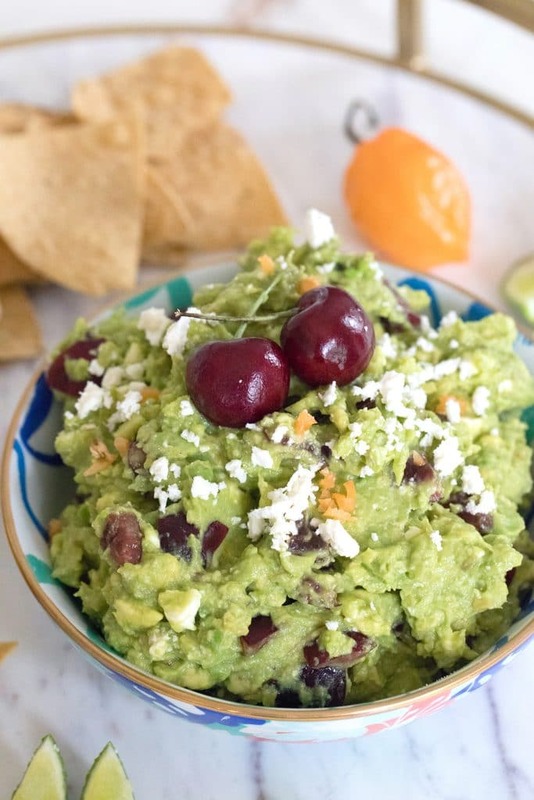 I could eat guac by the spoon, so this looks amazing with the cherries and habanero. So fun for the summer!